Who are we? We are Wisconsinites. Specifically, Madisonians, with all the progressivism that is usually implied. We grew up with parents working at the University of Wisconsin, in the excellent public school system, with city bus rides downtown to get ice cream at Babcock before meeting Mom at the library. Our parents' pension plan helped us open our store. 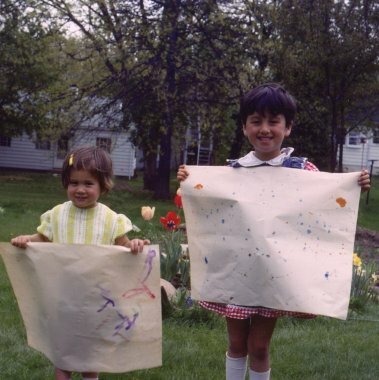 We grew up without a lot of money but with a broad community network which fostered our creativity and helped us flourish, through UW-Extension classes, Art Cart visits, bookmobiles and school and community recreation programs. The Wisconsin Idea for us is about the ways that education and the University are in service to the state, the ways that people collaborate and build upon the work of each other, benefiting from our collective knowledge and experience. We are forever grateful to this city and state for the ways it shaped us. We endeavor to pay forward all that we benefited from, with particularly emphasis on supporting local youth arts programs. We are artists. and scientists. We inherited a curiosity about the world from our librarian Mother and our scientist Father. Sachi has a B.A. in Art and English from Cornell College in Mt. Vernon, Iowa and her M.F.A. in Graphics from the UW-Madison. She enjoys drawing with pencil, hand-lettering, embroidery and painting with gouache or watercolors. Laura received her B.A. in Geology from Gustavus Adolphus College in St. Peter, Minnesota, and her M.S. in Geography from the UW-Madison. She enjoys collage and photograph and finds inspiration in maps and charts. We love paper. Both of us have collections of note cards and wrapping paper at home; we have always loved writing and receiving letters. For all that we love modern technology, we think there's nothing to compare to receiving a letter in the mail, touching pen or paintbrush to paper, using our hands and making. When we were little, Mom would give us the task of decorating the Christmas presents under the tree, and we spent hours making bows and curling ribbon. We love gifting. We are Christian. We grew up in Madison attending the United Church of Christ, a left-leaning Protestant Church which gives us a belief in the uniqueness and God-created value of every single person, regardless of race, color, sexual orientation, gender identity or any of the other ways we divide or separate ourselves. We embrace in all the ways that all the people find to express their creativity. We are citizens of the United States and of the world. We believe in liberty and justice for all, however much the ideals might fall short. We believe that as much work as we put into our store, we are nothing without the union that we stand upon. We did not build it ourselves. We are grateful for the opportunity to share our creative inspiration with you.